Stockton has been appointed to the board after long time board member Paula Key announced her retirement in January. The meeting was called to order at 12:00 noon by Chairman Kevin Marcum. Superintendent Charlotte Nasief did a roll call and on to the first order of business which was to approve the non-traditional instruction school day plan or Cyber Days plan. The motion to approve the non-traditional instruction school day plan was made by Gary Norris and seconded by Bobbie Bair, passing with a unanimous decision. The second item on the agenda was the approval of a board attorney. The board held a special call meeting on Monday, March 18, to try and hire a new attorney, but with Norris being absent from the meeting, the board decided to table the vote after being advised by Capps to do so in order to err on the side of caution. Marcum made the motion to hire attorney Winter Huff of Monticello as Board Attorney from April 1, 2019, to December 31, 2019. Sue Irwin seconded the motion and the motion passed with a 3-1 vote, Norris voting no on the issue. The next item on the agenda was to visit schools and one of the main purposes of this special call meeting. Each of the board members had a chance to walk around Clinton County Middle School and observe several classrooms throughout the remainder of the day. Clinton County Middle School Principal Angela Sloan gave a brief rundown of where each board member will be at different times and which teacher and classroom they will be observing during the afternoon. Sloan also gave the board some more information on what’s going on within her school in the upcoming weeks. Sloan has agreed to provide more information in a separate story during the upcoming weeks once the project has been finalized. One of those items consists of a grant applied for by a local pastor that will supply every student in the middle school with a pair of shoes. “We got all their measurements and we are going to hand them out,” Sloan said. Sloan also said the middle school needs $50,000 by the end of next year in order to replace the ChromeBooks purchased several years ago. The middle school has 265 ChromeBooks that will have a “end of life” at the end of next year according to Sloan. “We have to start now,” Sloan said. Sloan also announced to the board that the Clinton County Middle School will receive $8,000 as a part of the Follett Challenge. Shortly after each board member had observed different classes, the meeting was adjourned. The next regular scheduled school board meeting will be held Thursday April 11 as a work session meeting, and Monday, April 15 and are open to the public. 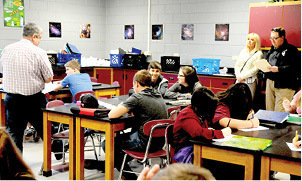 Clinton County School Board Chairman Kevin Marcum and Clinton County Superintendent Charlotte Nasief observed Tim Duvall’s class on Thursday during the special call meeting held at the Clinton County Middle School.